He is Eric Jacobus, a professional stuntman. He was even Striker from Mortal Kombat legacy, which is excellent by the way. 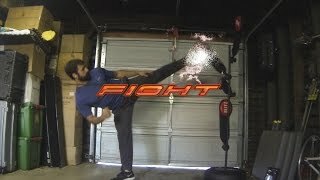 In this amazing video, Jacobus uses his amazing athletic ability to perfectly replicates Tekken’s, Hwoarang fighting moves. Hwoarang’s movelist from Tekken Tag Tournament 2 to be more specific. Eric Jacobud makes me want to pick up a martial art sometime very soon. He’s truly a sight to behold. Check out the video below.